shopspreezie has no other items for sale. Great purchase, very slow shipping and GREAT quality. The mask was no good, but it was easy to return. Fits Perfect , Appreciate The Deal !!! the only complaint I have is that it fits quite small for just about any adult woman or man. the quality of the ski mask is ok, but size wise its more for a older youth girls or boys. The mask should be identified as a children's mask of a person with a very small face. I have a normal size head and the mask barely comes down to my chin. It's not warm at all. 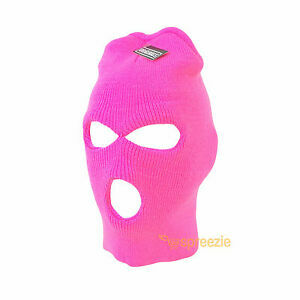 I recently made the purchase of this Pink Ski Mask and I absolutely don't regret one bit of it! I work with a company that does embroidery and the outcome of my ski mask made me even more satisfied.